I savored every word of Colum McCann’s elegant new novel, TransAtlantic. McCann has always been a writer who aims for a perfect image or a poetic turn of phrase, TransAtlantic is told in a gentle, unhurried style, almost a series of reminiscences, and the format allows McCann to give full play to his poetry. The novel is anchored by three historical events (in the order they appear in the novel: Alcock and Brown’s first transatlantic flight from Newfoundland to Ireland, Frederick Douglass’s reading tour of Ireland during the great famine, and Senator George Mitchell’s negotiations that lead to the Good Friday Agreement that enabled power-sharing in Northern Ireland and brought about the apparent disarming of paramilitary organizations), but the meat is in the story of four generations of Irish women whose lives intersect with these famous men and events briefly (the herstory to balance the history, if you like). If any novel can be said to have a single theme, or central focus, perhaps the unifying factor behind the stories in TransAtlantic is the individual’s desire for a freedom from external hinderances. The characters work for the abolition of slavery, the defeat of the Germans in two world wars, the end of religious strife in Ireland, economic independence, equal rights for women, the right of a woman to publish under her own name, the freedom to be accepted as an unmarried mother, the right to have ones’ children and grandchildren grow up safely, and centrally, the abolition of distance (physical and metaphorical): the normalization of crossing the Atlantic and the vast improvement in humanity’s ability to understand and help each other that this represented. In 1845, Frederick Douglass inadvertently inspires a young woman, a maid named Lily Duggan, to leave Ireland and go to America in search of a better life. Lily survives a horrific passage on a coffin ship, to find life in the teeming streets of New York City much less hospitable than she hoped for. A survivor, Lily eventually marries an ice-farmer in the upper mid-west, and becomes the matriarch of a line of women whose story drives the novel. Her daughter, Emily, who lives to write, yet must publish under a male pseudonym for years; her daughter Lottie, who takes to photography as her art; and finally Hannah, who must deal with both the death of her son during the troubles, and the economic ruin of the current financial crisis. The novel looks at a long series of characters trying to better themselves and their fellows, often in some way that unites Ireland and America: Douglass raising awareness of the cause of emancipation, Mitchell negotiating for peace, Lily making a better life for her children, Lottie quietly working to support the peace process. But it is the final characters who enter the tale, a very modern Irish family — an inter-racial marriage, never mind an inter-denominational one — that wraps up the story, and brings it firmly into the present day. In this, McCann with his characteristic hope and optimism points out the small but potentially significant seeds of change being sown in modern Ireland: a nation now absorbing an increasing number of immigrants, with new ideas, bonds, and possibilities taking root under the surface. In his more-inclusive conception of family, McCann seems to be observing that the future will depend less on family solidarity and dynastic inheritance (the cornerstone of Irish politics and community), and more on communal support, the exchange of new ideas, and an enlarged sense of community, beyond religion, beyond race, beyond blood ties. The last lines of his early story “Wood,” (from his excellent book Everything in this Country Must) in which a young boy watches trees “going mad in the wind,” the branches mindlessly “slapping each other around like people,” before the 12th of July marching season, have always struck me as one of the most apt metaphors for the discord in Northern Ireland ever put to paper. That McCann can now write a novel that is so optimistic, and chronicles such change a mere 15 years or so later, speaks volumes for how vast the changes in the political climate in Ireland have been. If novelists truly hold a mirror up to society, then it appears that the society McCann is reflecting in TransAtlantic is becoming a much less polarized one than he had to depict two decades ago. 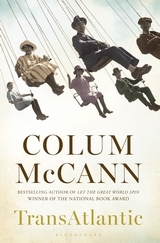 In TransAtlantic, McCann captures the great arc of globalization that increasingly shapes our age through the lens of one family’s history and some of the pivotal events that helped shape it, and leaves the reader with the hope that a corner has been turned, that Lily Duggan’s dream of a better life is finally coming to pass.